Our Vision : Promoting and teaching Rumi philosphy and practices in the sphere of development of human spiritual potential and personality which serve a better functioning in the society and family for peaceful world. Near the mighty Hagia Sophia Basilica and the magnificent Topkapi Palace, Hodjapasha is a delightful piece of the city’s striking cultural mosaic. Transformed from a large 15th-century hamam (Turkish bath), welcomes visitors since 2008 under its high dome ceilings to showcase some of the best of this vast country’s traditions . Hodjapasha has two sections. First is an exhibition and foyer area. The other section is performance area which has a circular glass dance floor and a musicians stage. Spectatator seats are located around circular dance floor and has a capacity of 220. Perfect lighting and beautiful decoration turnes this historical building to a very mystic and intim place. Hodjapasha Hamam is a large double hamam, meaning it was originally built as a hamam accomodating both man and women in seperate sections. It is known as Hodja Pasha because of the district and because Hodja was the nickname of Sinan Pasha. 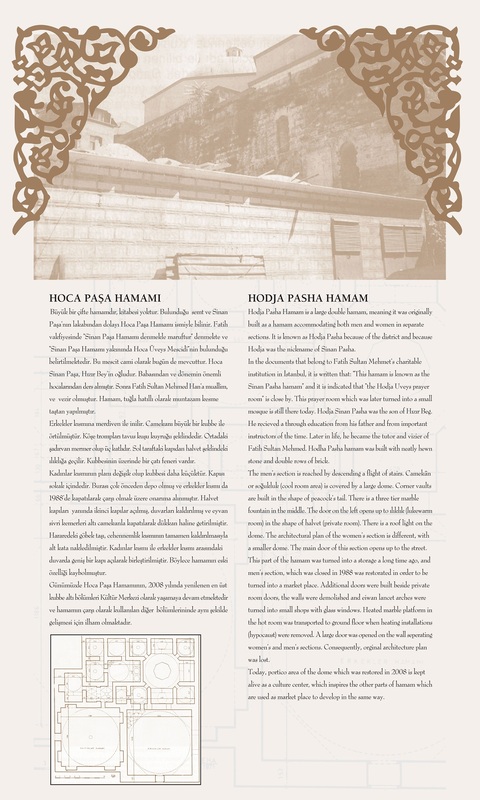 In the documents that belong to Fatih Sultan Mehmet’s charitable institution in İstanbul, it is written that: “This hamam is known as the Sinan Pasha hamam” and is indicated that “the Hodja Uveys prayer room” is close by. This prayer room which was later turned into a small mosque is still there today. Hodja Sinan Pasha was the son of Hızır Beg. He received a through education from his father and from important instructors of the time. Later in life, he became the tutor and vizier of Fatih Sultan Mehmed. Hodja Pasha hamam was built with neatly hewn stone and double rows of brick. The men’s section is reached by descending a flight of stairs. Camekan or soğukluk (cool room area) is covered by a large dome. Corner vaults are built in the shape of peacock’s tail. There is a three tier marble fountain in the middle. The door on the left opens to ılıklık (lukewarm room) in the shape of halvet (private room). There is a roof light on the dome. The architectural plan of the women’s section is different, with a smaller dome. The main door of this section opens up to the Street. This part of the hamam was turned into storage a long time ago and mis men’s section, which was closed in 1988 was restored in order to be turned into a market place. Additional doors were built beside private room doors, the walls were demolished and eiwan lancet arches were turned into a small shops with glass windows. Heated marble platform in the hot room was transported to ground floor when heating installations (hypocaust) were removed. A large door was opened on the Wall seperating women’s and men’s sections. Consequently, original architecture plan was lost. Today, portico area of the dome which was restored in 2008 is kept alive as culture center, which inspires the other parts of hamam which are used as market place to develop in the same way.